Ten years ago in Baghdad, on the eve of the invasion of Iraq, I sat with my Iraqi friend in his photo store. I was his last customer, he said; the bombs would begin tomorrow. And then he began to quietly weep. We sat in silence for several minutes before he spoke again: 'We don't know our future now, we have no idea what will happen.' It was this uncertainty that raised his anxiety, having no idea how it would all turn out. Indeed nobody knew. 'I'm so sorry,' I whispered, and wept quietly with him. Then he held out his shaking hand and gave me the prayer beads he was holding. 'Thanks for being here,' he whispered. I remember thinking that his life, and the lives of others like him, would not be given a second's thought in the coming days as the missiles rained down on Baghdad. The bombs started the next day, early on 20 March 2003. I carried his prayer beads every day. Ten years on I doubt that in his worst imaginings, he would have predicted what we see in Iraq today: a divided, violent, failed state, its social fabric torn, a new sectarian religious dictatorship in place receiving orders from outside powers such as Iran, political death squads, Al Qaeda cells wreaking havoc, flagrant human rights violations, minorities persecuted almost to the point of extinction. I could go on. I went back to the photo store of my friend the next time I was in Baghdad, a few months after the initial invasion. It was still boarded up. I continued to return each month, but there was no sign of him. I have just returned from my fifth visit to Iraq and again I made the regular pilgrimage to the place on busy Saddoon Street where his shop used to be. I don't think I expected him to suddenly be there. The trip is more about marking that solemn occasion, the day before everything changed, like visiting a memorial, or a gravesite — to commemorate. As the world marks the ten year anniversary of the invasion of Iraq the mainstream media hosts many 'experts', 'analysts', former generals and politicians, most of whom have never been to Iraq or, if they have, resided in the 'Green Zone', Saddam's former palace, a virtual foreign city-state surrounded by concrete and razor wire. This retelling of history from the view of official sources excludes the experience and opinions of my friend in the photo store, whose life was obviously affected in ways we still don't know. This week the media will also smugly pose the question they have always posed by way of justification. In my opinion a lazy, dishonest question: 'But isn't Iraq better now that Saddam Hussein is not in power?' Iraqis respond with a look of bewilderment when they hear this question. That's because it's a question that assumes that although Saddam has gone, nothing else has changed. But everything has changed. The challenges Iraq faces today are immense. Iraq is crumbling. Infrastructure, worn from enduring years of western sanctions, is still waiting for refurbishment. Major cities still only receive four to five hours of electricity a day. Tap water is undrinkable. Environmental pollution caused by toxic remnants of war and industrial pollution has resulted in an environmental catastrophe and health problems such as cancers and birth defects. Iraq, struggling with so many other issues, does not have the capacity to deal with the long-term program of clean up and decontamination that's required. Poverty is at disturbing levels. Slums I would normally equate with third-world countries have emerged on vacant land overflowing with families that have been internally displaced from war and violence. This is all despite a massive injection of foreign aid, of which $60 billion has been identified as being completely squandered. Exhausted by a constant sense of chaos and unpredictable violence, it's the issue of security and instability that concerns Iraqis most. And they blame the US invasion and Iraqi Government for creating the chaos. So every week for the last three months around half a million people across Iraq come out in anti-Government demonstrations with a list of demands covering issues of discrimination, arbitrary arrests, imprisonment without trial, torture etc. When pro-war commentators speak about how much better off Iraq is today, I think of the Iraqis who have voted with their feet. About three million of them choose to live in squalor as refugees in neighbouring countries rather than stay another day in the 'new Iraq'. It's their view I value when considering the legacy of the 2003 invasion. I often wonder what the photo store man would think, when looking at the ledger with a ten-year perspective. On one side is the positive point that Saddam has gone from Iraq, but how long would be the list of negatives on the other? Ten years on, this is a more honest question, I think, and one we can learn from. Donna Mulhearn is a freelance journalist and peace activist. She will return for her fifth visit to Iraq this year. Follow Donna on Twitter. 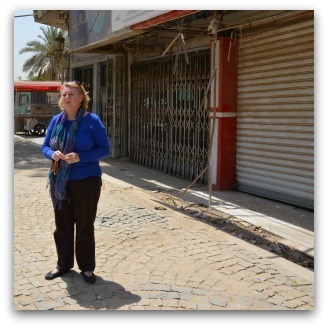 Image: Donna stands outside the former photo shop on Sadoon Street, holding the orange prayer beads gifted to her by her friend, who owned the store. Recent articles by Donna Mulhearn. We should be ashamed of ourselves for failing to resist the decade of sanctions and the decade of war visited upon the poor Iraqi people. God willing we will stand more strongly against any future adventurism. Great to see you presenting these views on TV news programs last night Donna. I'd like to see this article syndicated to the mainstream press and to radio journalists in the perhaps vain hope that airing of these things will help us learn something from our mistakes. Donna great article.We were standing with you in Iraq in the photo store in silence crying with you.Thank you for reminding us. I too weep quietly Donna. Thank you for your faithfulness to the memory of your friend and his now devastated homeland. Yes Jane, another inconvenient truth the media won't publish. And they have the gall to attack Conroy. I think the Coalition of the Willing made a terrible mistake to go into Iraq on false, concocted "information". People in the Middle East have been involved in terrible things for the last 4000 years from the Assyrians to Saddam Hussein. The latter was a monster. However, his ousting appears to have made things worse. Ironic that. I remember how the Australian media painted Donna and other "human shields" as crazy people ten years ago. In fact, the crazy people were the ones launching the war. it pains my heart that still, after all this time, after all this death and destruction and displacement and dismembering, nobody has been held accountable. Iraq has lost much in the last 10 years. But Western Democracies have lost much as well. Most importantly, we seem to have lost the concept of accountability. One Christian engineer remembers celebrating religious festivals with his Muslim neighbours. They in turn would celebrate Christmas with him. Such interfaith experiences are almost unknown now. Iraqis tell me that at least under Saddam you knew where the boundaries were. Now there is uncertainty and indiscriminate violence.